Pre-construction activities such as Pile Loading Test and Geo-Technical Survey for one year from January 2019 to December 2019. New Delhi (Metro Rail News): The National Capital Region Transport Corporation (NCRTC) a Joint Venture company of Government of India and States of Delhi, Haryana, Rajasthan and Uttar Pradesh is mandated for implementing the Regional Rapid Transit System (RRTS) project across the National Capital Region, has started pre-construction activity with Geotechnical investigation, on the Delhi-Gurugram-SNB RRTS corridor. The corporation started the underground utility mapping on the corridor recently. Pre-construction phase – January 2019 to December 2019: Pre-construction activities such as Pile Loading Test and Geo-Technical Survey for one year from January 2019 to December 2019. The base construction cost of the corridor is estimated to be Rs 24,975 crore and construction work is expected to be complete in 5 years time excluding one year of pre-construction activities. It will be funded by the central government (20%), concerned state governments (20%) and bilateral/multilateral funding agencies (60%). According to the sources, the 106 km-long corridor project is planned to be implemented in three stages. 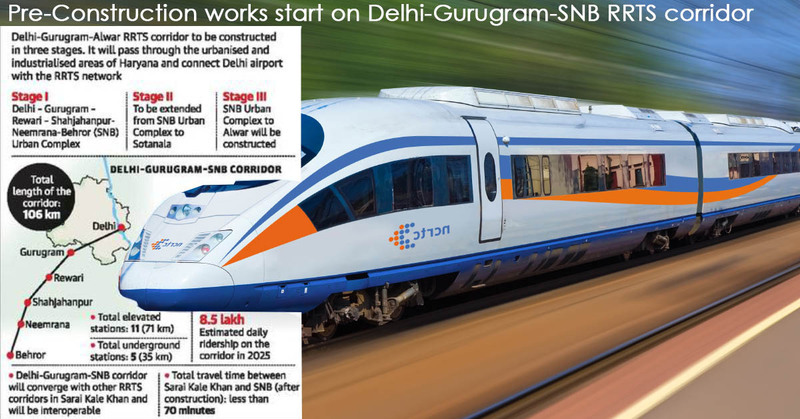 In stage I, Delhi – Gurugram – Rewari – SNB Urban Complex will be constructed. In Stage II, it will be extended from SNB Urban Complex to Sotanala and in Stage III, SNB Urban Complex to Alwar will be constructed. This corridor would pass through Manesar, Bawal and Neemrana. The corridor will be elevated for about 71 km, the remaining 35 km will be underground, mostly in Delhi & Gurugram. 11 station on the corridor will be elevated while five will be constructed underground. It will converge with other RRTS corridors in Sarai Kale Khan and will offer interoperable, facilitating commuters’ movement from one corridor to another without having to change trains. RRTS trains with a design speed of 180 Kmph will be available at a frequency of every 5-10 minutes. The infrastructure is being designed for up to nine coaches train. These trains will be air-conditioned with transverse seating and overhead luggage space. The daily ridership on this corridor is estimated to be 8.5 Lakhs in 2025.